Hawaii Five-O: A Thousand Pardons--You're Dead! (1969) [James Watanu]: Dies of a heart attack after Harry Guardino intimidates him and then takes away his pills. Airplane! (Flying High) (1980) [Japanese General]: Commits suicide by hara-kiri while sitting next to Robert Hays on the plane, to escape from having to listen to Robert's flashback. Black Widow (1987) [Shin]: Dies of a heroin overdose in his office, when Theresa Russell forces him to take the drugs at gunpoint. His body is shown afterwards when the police investigate. Cyber Bandits (1995) [Tojo Yokohama]: Beaten to death (off-screen) by Nils Allen Stewart and another thug after they break into his tattoo parlor while he's working on Martin Kemp. 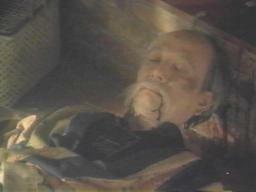 His body is shown afterwards when Martin regains consciousness. Guns and Lipstick (1995) [Mr. Song]: Shot repeatedly in the chest by a hitman in a drive-by shooting outside the police station.